The TS-EC2480U R2 supports 6Gbps hard drives driving over 3,700 MB/s throughput and 410,000 IOPS*. Featuring with Intel® Xeon® E3 v3 Quad-Core Processor and 4 GB DDR3 ECC RAM, the TS-EC2480U R2 greatly enhances efficiency of CPU-consuming tasks and serves more concurrent tasks at the same time. The TS-EC2480U R2 supports two on-board mSATA internal cache ports, and up to 4 SSDs can be used for caching. By installing mSATA flash modules (optional purchase), the IOPS performance of storage volumes can remarkably boost. It is perfect for improving overall workflow of random IOPS demanding applications such as database and virtualization. The internal cache port design reserves the space of hard drive tray for more storage capacity. The TS-EC2480U R2 offers four inbuilt Gigabit Ethernet ports and features two inbuilt 10GbE SFP+ ports to deliver 10 Gigabit high speed network. The 10GbE-ready TS-EC2480U R2 delivers lightening data throughput. 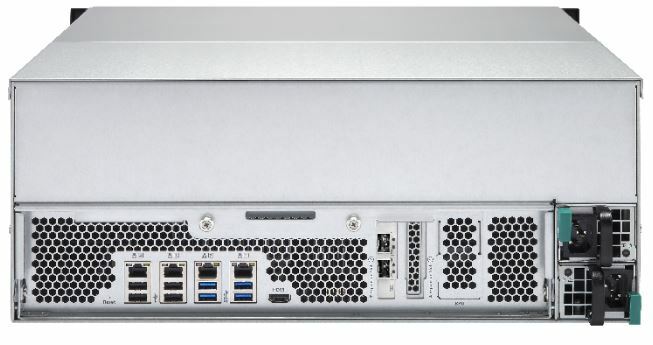 Coupled with the support for large storage capacity, the TS-EC2480U R2 is perfect for data centers to storage big data and excel in fast data transmission, and for editing large size videos on-the-fly without transferring the videos between the TS-EC2480U R2 and desktop computers.